If you were ever a fan of Pokémon as a kid or teenager, you’ll know about Pokémon Go, a new app developed by Niantic. Pokémon Go creates an augmented reality experience (something virtual appearing in the real world), to allow you to chase Pokémon characters all over town, to lure them, capture them and train them for battle. It’s currently the no. 1 free app on iOS and the Google Play Store and is beating Twitter, Instagram and even Snapchat in terms of downloads and users. 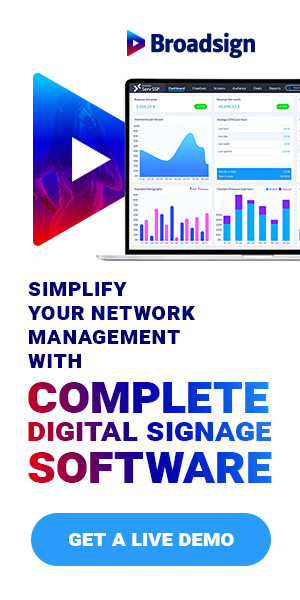 One of the ways small, local businesses can jump on this trend is by using digital signage to flag their store or business as a key part of the action. Pokémon Go has already done most of the hard work – local businesses everywhere are seeing higher foot traffic, more customers and a warming community vibe, from users obsessed with the game and the nostalgia of it. This is because users have to get out and about to ‘Pokéstops’ and ‘gyms’ if they want to catch rare Pokémon characters – the shiny Charizards and the elusive Tauros – or battle other users. Other features, such as egg incubation, can only be unlocked by walking. According to this article by INC, Pokémon Go is driving an insane amount of business (and sales) to those in the right areas. It also gives multiple ways small businesses can capitalize on the action – from setting up pop-up shops, through to advertising on Facebook. Pokéstops are where players head to for rewards. If your business is one, or is near one, you need to let users know. Switch the screens in your store window (or add one) to let people know you’re a Pokéstop, or the amount of metres to the next one. You could even get players to tell you the recent rewards they’ve had and share this on your screens. Rare and difficult-to-lure Pokémon are the holy grail of the Pokémon Go world. Use your screens to show big, juicy shots of the rare Pokémon that have been captured near your business. You can easily find images of most rare Pokémon on Google, even if you haven’t managed to capture them yourself. Or get passer-bys who have to send you images, in return for a free drink or even just the use of your bathroom! With a digital signage content management platform (I run a company called ScreenCloud), uploading a new image to your digital signage playlist is as easy as uploading an image to Facebook, or any other social media channel, so you can add in rare Pokémon characters all the time, seconds after you find them. Catching Pokémons is thirsty work. Sometimes it can take hours. Use your digital signage displays to highlight the discount you’re giving to those with this tough task. Entice them in with a digital menu board, offering a discount on a snack, or drink and then reap the rewards each time they enter, in search of Squirtle. Pokémon Go is undoubtedly becoming the next big thing in location-based marketing (at least for a while). With the right digital signage CMS, a screen and a little bit of Pokémon-knowledge your local business can feel like it’s just found Vulpix.